There were two of us who moved into this squalid little hole in Asakusa, a studio apartment. It was mid-summer many, many years ago. We needed somewhere for our last few months in Japan as our lease had expired on the old place. It was pretty cheap for an apartment in Tokyo so we paid for the whole thing in advance. At least it had air conditioning. I think we made it look quite nice – it was clean and tidy . 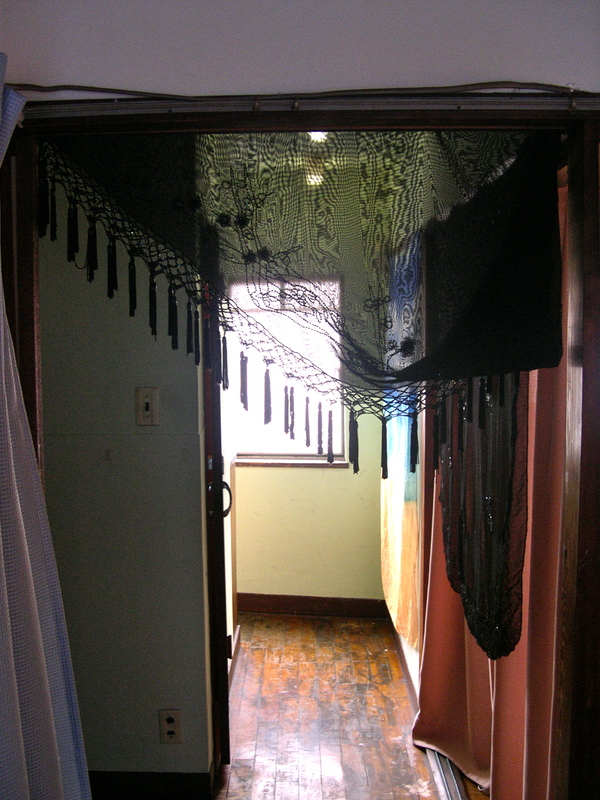 We’d scrubbed it thoroughly and thrown up a few of J’s sarongs as curtains, vacuumed out the dusty wooden cupboards and made it look like a home. This place was a really old and bizarre. Included in the apartment: a payphone in the kitchen; a very expensive toaster; an ancient, cracked Japanese squat toilet that I fell into several times and it came with floorish beds and furnishings. And forty stairs up. It was a short-term lease. The building management team were not very friendly. 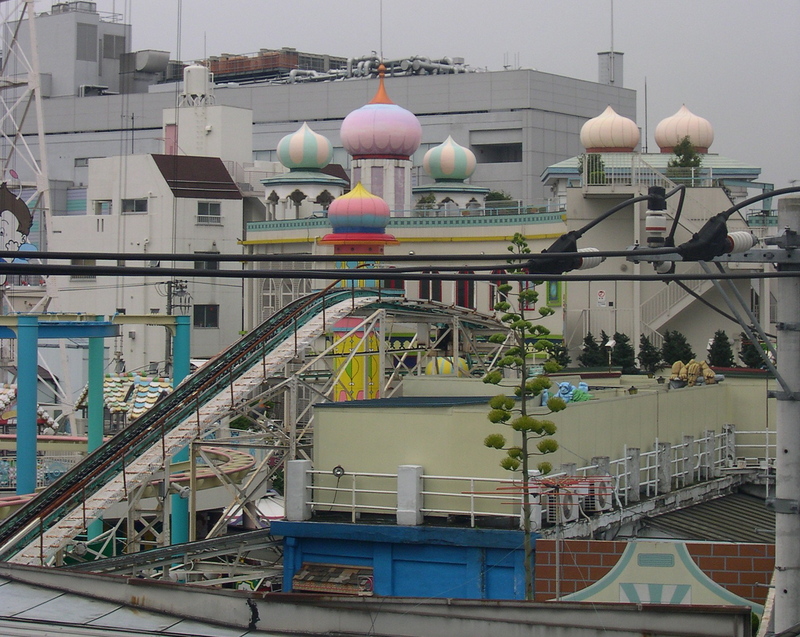 We were right in front of Hanayashiki – the oldest amusement park in Japan. Of course, being the hottest months of the year we never actually went there but we had a nice view. J and I were both busy working in nightclubs or bars, hostessing or teaching all day and night. 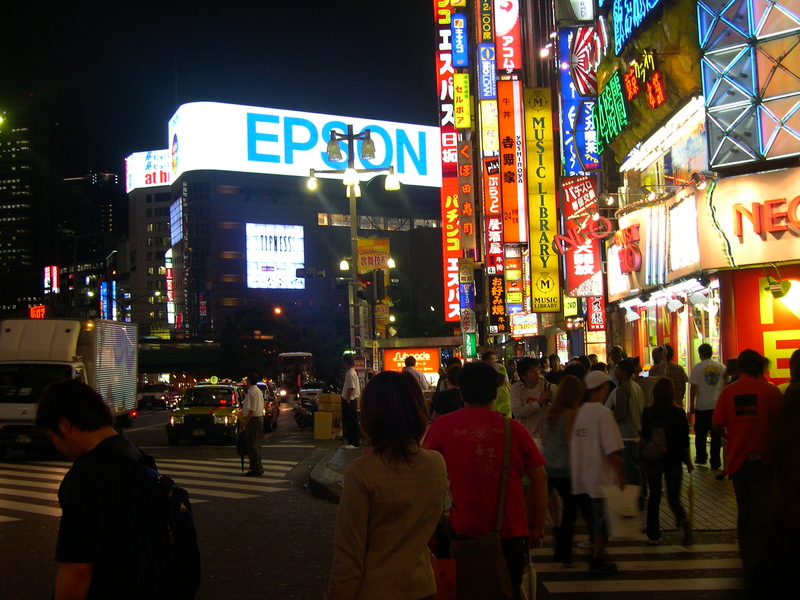 We were there to make as much of that precious Japanese Yen as we could to take with us on our travels…. until we both quit/lost our jobs 3 weeks before we were set to leave Japan. We thought perhaps it was a good thing: we had time to explore Japan and just have a holiday before we went our separate ways: J was going back home to study and I was off on a backpacking adventure around the world. After 2 days the house was spotless and we were extremely bored. There was no TV and English books were rare and very expensive at the time. I think we fought to the death over a Jackie Collins book we’d found on a train one day. J kept a boring journal of our daily progress and I took dull photos all day. It was so hot and a one way fare to the nearest beach was $30. After 7 days we’d spent way too much money and couldn’t stand the sight of each other. We spent at entire day sitting on our futons, staring at each other. Our friend Greg the Canadian worked in a nightclub in Roppongi and gave us all these drinks when we visited. 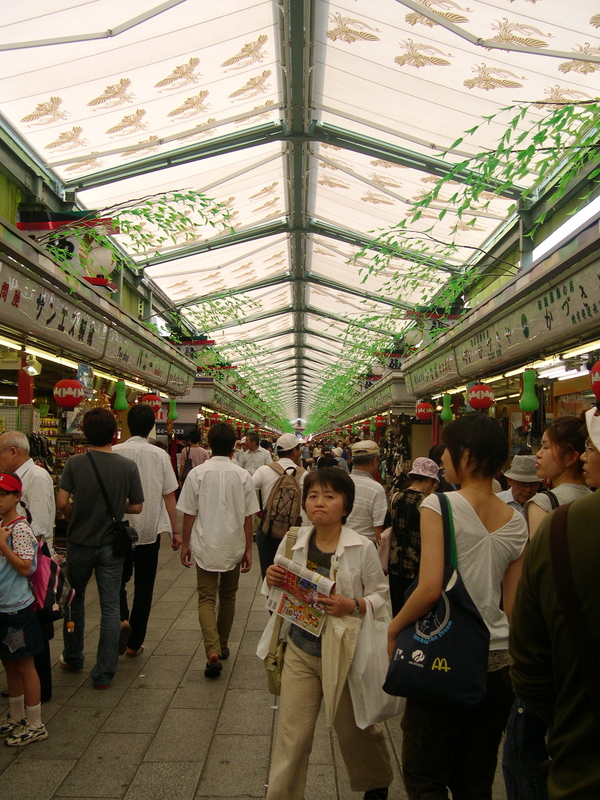 Then he got fired too so we all sat around together in in our apartment, the temple, the ¥100 kaiten sushi bar…. the novelty of roaming around like a teenage thug wears off after a while. 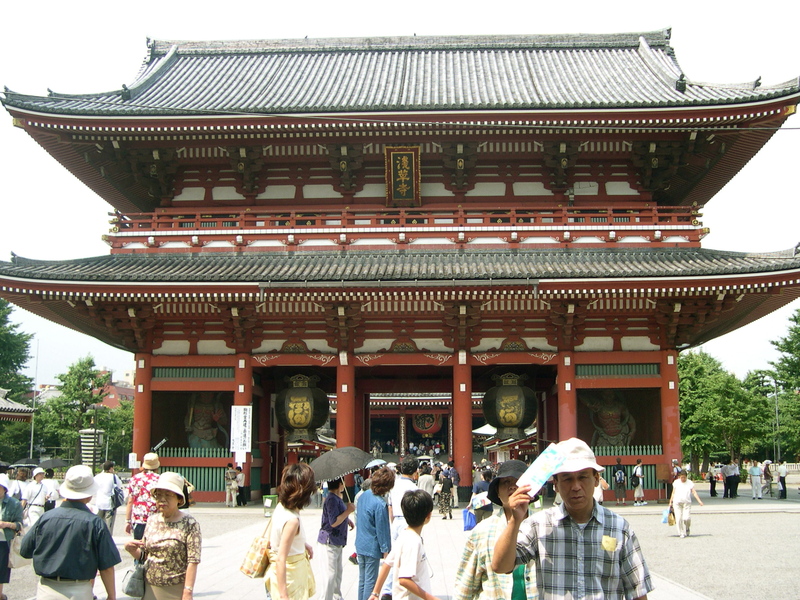 Fortunately, we lived near Senso-ji temple which was a very cool place to hang out. We found our own peaceful place in the garden. To stop the endless boredom we also visited embassies, more temples, those newfangled things call “internet cafes” that were full of fancy computers… anything that kept our minds busy and didn’t drain use all the money we’d saved. After J’s ridiculous Japanese stalker who kept jumping out of the bushes bearing gold jewellery every time we went to buy milk we decided to stay inside the flat. Hanabi season was upon us and fireworks were available everywhere. For about $10 USD we bought a bag of crackers and terrorised the neighbours. That was a fun night. After an uneventful 2 weeks it was time to go and J and I set about cleaning up and packing the day before our departure. I was in charge of the shoe cupboard and that is where I found it. A garbage bag full of money. Coins of course, but coins in Japan can be worth quite a bit. A great big pile of them glistened on the floor, like a pile of golden coins in Aladdin’s cave. The problem was that the bank was closed, we were flying the next day and we had about 10 kg of coins to dispose of as we pleased. J did stop to think, she went straight to the 7/11 with 140 ¥1 coins to buy Ziploc bags and starting sorting the coins. I put the ¥500 coins in bags of 10, the ¥100 and ¥50 into bags of 10 but it was J who organised hundreds of dollars worth of ¥1 and ¥5 coins into bags worth about $1USD. She was fabulous. After hours organising the coins she frog-marched me to the shops. We went straight out three and a half hours before everything shut for the night in Shinjuku, the souvenir shops in Asakusa and Asakusa’s Rox Mall. We bought Japanese geta sandals, silver bracelets, a book, a silk skirt, Kenzo perfume, a pair of jeans, Sake flasks and cosmetic bags full of makeup. I forgot how much money was actually there but it was an awful lot of money, and the summer sales were on so we could buy even more than we expected. Most of the people in the shops laughed at our payment in 10-100 coins per transaction but the old man at the sake shop didn’t see the humour. By 9pm we sat in a cafe with our piles of shopping parcels, exhausted. I think at least half of what we bought must’ve been Japanese gifts for our family – we were rather nice girls, I thought. As we returned the key and collected our deposit the next morning, the real estate lady noticed our shopping bags from Comme Des Garçons, Mitsukoshi and Gap. It was she who revealed to us that it was a custom to leave any spare coins for the cleaner as one leaves an apartment Many single men in their small company apartments left the change they accumulated in the house, but a whole bag of it? Oh well, we left it cleaner than it ever had been – the staff wouldn’t have had to do much work. That hot ,Tokyo afternoon in August was one of the most enjoyable I’ve had on my travels and I’ve not laughed as much since. J and I chat about it often. It always pays to clean out the cupboards.